The Philadelphia 76ers need to trade a big man, and according to recent NBA rumors, the Chicago Bulls may be a suitor in a trade involving Jahlil Okafor. The Philadelphia 76ers‘ most talked about need this season is clearing their frontcourt logjam. The team has three big men who were lottery picks in recent drafts, and they don’t really work well together on the court in any combination whatsoever. While it seems like moving one of the bigs would be a priority, the team has approached the logjam with little rush, and doesn’t seem to realize it’s as big of an issue as it is if they want to be competitive any time soon. Still, despite that the team doesn’t seem to be shopping their bigs with too much urgency, a little desire for one of them is developing. 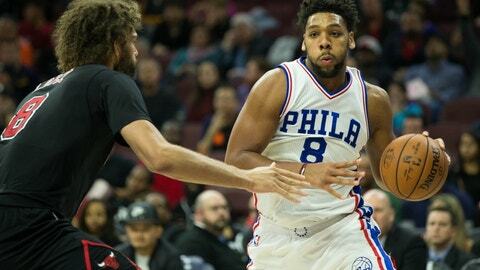 The Chicago Bulls, according to a recent report from CSN Chicago, want Jahlil Okafor. The CSN report noted that at this point, a trade is not imminent. But they were adamant that the talks between Chicago and Philadelphia were and are happening, which is very encouraging, because it’s seemed like, from the outside, Bryan Colangelo hasn’t even picked up the phone regarding his bigs. The report also said that the interest is more so from the Bulls. It would also be best for the Sixers to move Okafor, because he is the one center that doesn’t really seem to fit with what the Sixers want to do — at least right now. The team has won a string of games lately, and they’ve been won with defense, something Okafor tends to struggle with. Okafor has been playing more lately, but was benched for a large amount of games as a healthy scratch in favor of Nerlens Noel playing. Earlier in the season, Okafor was playing and Noel was sitting (although Noel was also recovering from an injury). It’s possible that the Sixers increased Okafor’s minutes to show him off, in a sense, to the league in hopes that someone would see something in him that caused them to want him. So, if a trade were to happen between the Bulls and Sixers, we know who Philly would give up, but what about Chicago? At this point, Philly may have to bite the bullet and take almost anything that is offered to them, but it’s worth noting that it was rumored earlier in the year that Jimmy Butler was on the trading block, a player that could immediately transform the Sixers. That’s an unlikely scenario. More likely would be the Sixers getting Denzel Valentine, a rookie this season, from the Bulls. Valentine has not gotten many minutes to develop, but the Sixers could add him to their bench and develop him rigorously over the next few seasons and turn him into a very valuable piece of their ever-growing puzzle. It’s also worth noting that Jahlil Okafor grew up near Chicago, so he would probably be pleased with his new location if this were to pan out. This trade doesn’t seem like something that will pan out for sure, but if it’s the only thing that pops up for Philly in between now and the trade deadline, they should take it, as long as the return is greater than nothing.